Mopa air port would be made operational by 2017 while continuing civil and commercial operations at Dabolim air port, announced chief minister Manohar Parrikar today. Replying to the demands on air port in the Assembly, Parrikar also informed the House that process of global tender would begin with Request for Quotations (RFQ) to be floated soon after Gudi Padwa. He said all the formalities to acquire the land have been completed and the land would be in the possession of the government by 8 April. He also made it clear that development of land within seven kilometres of radius from the central point of proposed Mopa air port would be frozen. Parrikar once again clarified that the RFQ would have a clear clause to keep in mind that Dabolim air port would continue to be used for civilian traffic. The chief minister informed that Goa is projected to be attracting 5.5 millions of tourists by 2017, which is completely out of reach for Dabolim to handle, even with the expansion plans. He said Mopa was not his decision but the Congress baby when Pratapsing Rane was ruling Goa and the Congress at the centre. He also read out excerpts of the union cabinet meeting held on 4 May 2010, which approved the feasibility report of AICAO on whether both Dabolim and Mopa could co-exist. “There is a cabinet decision to divide traffic equitably between both the air ports,” he said, while also pointing out that the report had specifically stated that Dabolim would be oversaturated by 2013. The green field air port was thus mooted by both the Congress governments after getting convinced that both the air ports could be operational and viable. 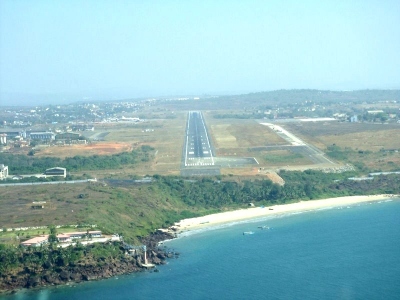 The chief minister also dismissed the fear that Chipi air port in Sindhudurg (Maharashtra) could be a threat to Mopa. Chipi is for small air crafts whereas Mopa would handle huge air crafts like A380 which could carry 650 passengers. “Let us remember that tourism in future could survive only if we have a big air port”, said Parrikar. He also said passengers from Mopa would reach Varca in Salcete before they could travel 46 kilometres of distance to Sawantwadi. The CM thus dismissed the theory that Mopa would benefit tourism in Konkan than Goa. The government would build its own expressway if the central authorities do not take it up from Mopa to South Goa. While allaying the fears expressed by opposition members that Mopa has been developed to benefit the land owners around it, Parrikar said no development of land would be allowed around 7 kms of radius. “This will even protect the forest around Mopa and it crosses even Maharashtra border towards the North”, said Parrikar. Regarding compensation to the farmers who would lose land due to Mopa, the CM said they would be paid up to Rs 400 per sq mt after bringing into force the new Land Acquisition Policy while the youth would also get employment. In addition, Parrikar said Goan youth would be trained by opening a training school so that they get suitable skilled jobs at the air port.